Scooby-Doo was my favorite cartoon growing up… my little sister and I would watch it every morning together. At just 37 years old, she lost her battle with breast cancer about 2 months before Halloween. She loved this time of year so much and would always be right into it. So for this first Halloween without her, I wanted to do something special, that she would have loved on many levels. While the past few years we would split up and do our own thing, I started putting together this group costume to ensure that my two daughters and her two sons would have fun spending this Halloween season together, and have pictures to cherish when they get older. They enjoy watching the cartoons as much as I did, so were really excited when I shared my idea with them. While the one latex mask was the only actual “costume” purchased, most of it was just items of kids clothing purchased separately, either online or at the mall. Shaggy – My 2 year old nephew, wearing a plain green t-shirt and brown pants. Some washable black Crayola felt for a little bit of beard on his chin. While we kept his hair shaggy as long as we could, the boys did get haircuts before the week of Halloween events were done. Fred – My 4 year old nephew, wearing blue pants and dress shirt, with a white v-neck sweater. The orange ascot was adult sized, so was cut and sewed down to his size. Daphne – My 6 year old daughter, wearing a dress sewn togther by my mom and aunt. I bought some purple and lavender fabric and we traced one of her long-sleeve dresses to make the pattern. She’s wearing light pink tights, green scarf, lavender hair band and purple flats. 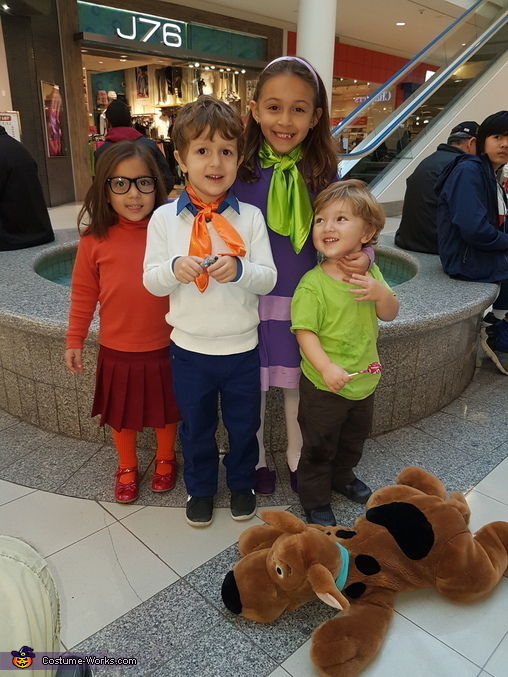 Scooby-Doo – We have two different large stuffies and depending on whether it was a kids Halloween party or trick-or-treating, we’d decide which one to bring along. I won the big one at a fair about 20 years ago. The Creeper – That’s my dad (grandpa), wearing a black t-shirt and an old green suit that I bought in the 90’s. I dug it out of the closet of my old bedroom at my parent’s house. I can’t fit in it anymore, so he did the honors. I purchased the officially licensed Scooby-Doo Creeper mask on-line. Aside from the suit and Scooby stuffies (that I’ve had for years), the rest of the individually purchased items totaled a little over $200.